A seductive novel about a privileged but damaged Manhattan wife whose main source of stability — her marriage — comes under threat, from forces both without and within. 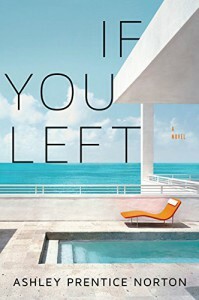 Fearless, darkly funny, and compulsively readable, If You Left explores the complex dance that is the bipolar marriage, and the possibility that to move forward, we might have to destroy the very things we've worked hardest to build. This was such an intriguing look into the mind of a lady with bipolar disorder, and I found it hard to put down.I really loved how the speech in this book was written with a lot of double meanings and a lot of room for interpretation, some of which was very clever and had me rereading sections. Though it was in places a tad confusing, it was a trope that worked really well and had a good payoff. Ollie and Althea's relationship was heartbreaking. They'd had what started off as the picture perfect true love that might have lasted had Althea's love not disintegrated. The devolution of their marriage into a caregiver/patient role made me cringe, and made me root for Althea so much more. There were scenes that felt like borderline erotica at time, which I don't normally appreciate very much, but these had a relationship with art. Althea's photography concepts had interesting ideas behind them that added to this dynamic. The way the "Tombs" and the "Visions" were portrayed was fascinating to read. The way Althea mentally interacted with the things around her was absolutely unique and shaped by her states of mind. Had she not had a seemingly bottomless bank account, I shudder to think of what her life may have been like. For anyone intrigued by mental disorders, this is a strong and addictive read.